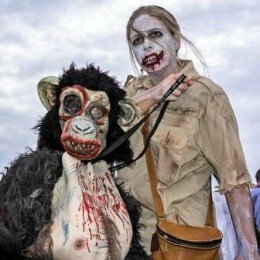 On the first Saturday in October, thousands of zombies stagger down the streets of Asbury Park, New Jersey, in one of the largest "Walks of the Undead". It's the Zombie Walk: A fun and wacky event for the entire family that raises money for charity. Singles, couples, families, children and groups lurch down the streets in tattered, bloodied costumes to the delight of tens of thousands of spectators. Think Michael Jackson's "Thriller" on a larger scale! A Zombie is a fictional monster, but more than that, it's a state of being: somewhere between life and death. A zombie is a shell of a person, who staggers around, dragging its legs, walking off-kilter, and looking for other humans to devour. 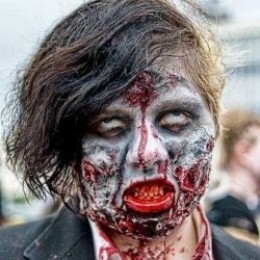 In some ways, a zombie is like a vampire, as it can "turn" a human being into a zombie by biting it. Zombies normally have bloody clothes, pale skin and blank, staring eyes. Some are silent; others moan and groan, while others have been known to mumble "brains!" Zombies don't move very fast, since their bodies are so fragile. However, they can catch and eat you before you know what's happening! 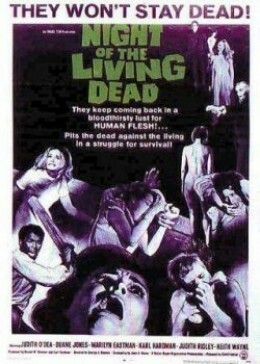 Many movies have been filmed about zombies, such as "Night of the Living Dead" and "Dawn of the Dead". Zombies have shown up in comic books, tv shows, cartoons, and music. The Center for Disease Control has even written a guide on how to survive a zombie apocalypse! Where is the Zombie Walk? The Zombie Walk is held in Asbury Park, New Jersey. Asbury Park is a small town of about 16,000 people, located on the Jersey shore, and is known for it's beaches and music venues. What Is The Zombie Walk? Families, couples, children and pets come from across the country to dress in zombie clothing & makeup, and lurch across the streets of Asbury Park, all in the name of charity. 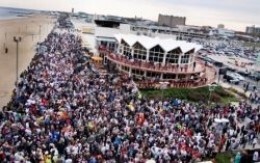 In 2010, the Guinness Book of World Records documented 4,093 zombies at the Asbury Park Walk, making this Zombie Walk the largest gathering of the Undead. Add another 15,000 attendees who came to watch, and it was the biggest gathering of it's kind. Check out this YouTube video to view all 4093 zombies! the 2nd Saturday of October! To help you prepare for the Asbury Park Zombie Walk, you'll need to know the schedule of events. Keep in mind that it occurs on the 1st Saturday of October each year, and begins at 10:00 am. Get a lot of restful sleep the night before, because this is a big day for zombies! Zombie Blood Drive and Food Drive - Donate your blood or some canned food. It's all for a good cause! Thriller Dance Team Performance - A huge team of zombie dancers perform Michael Jackson's "Thriller"
The Zombie Walk begins! 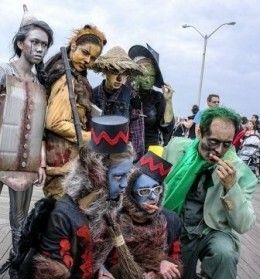 Starting on Asbury Park Boardwalk in full costume, stagger with several thousand of your closest zombie friends & fiends along the streets of Asbury Park. Hit the streets and clubs of Asbury Park to participate in great Zombie Walk after-parties. If you've had a bit to drink, no one will take notice of your staggering! To get an idea of what you'll experience at the Zombie Walk in Asbury Park, take a long, hard look at these videos! You'll need a great costume to participate in the Zombie Walk. Some tattered clothing, a bit of blood, and some bad teeth will set the mood. An easy way to carry your valuables while out on the Zombie Walk. This purse looks just like a bloody meat cleaver, yet has enough room for your credit cards, ID, and Zombie makeup. Zombie skin seems to deteriorate rather quickly, so unless you wish to make your own wounds, these tattoos work much better. From bleeding wounds to slashes, these temporary tattoos will add the proper oozing look to your costume.